No.1 View of Almorah, looking to the S.W. bl.uk > Online Gallery Home	> Online exhibitions	> Asia, Pacific and Africa Collections	> No.1 View of Almorah, looking to the S.W. 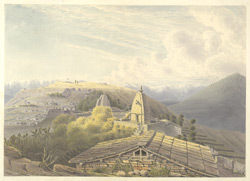 Water-colour painting of Almora by James Manson (1791-1862), c.1826. This is folio 1 from an album of 12 drawings of landscapes in Almora by Manson. Almora is situated on a 5km long horse shoe ridge, 1,650 metres above sea level in Uttar Pradesh. The area has a long history of habitation however the town first came to prominence in 1560 when Raja Kalyan Chand of Kumaon decided to make it his capital. In 1798 the area was taken over by Gurkhas but, they were expelled by the British in the Gurkha wars of 1814-15. The town is characterised by the local slate stone which used to construct houses and roads and is also known for its temples, in particular the temple of Goddess Nanda Devi.